This book “habits of the ultra-successful” is the how to book to turn around your life. Probably if you are reading this book, is because you need something to change in your life, it could your finance, relationships, health or to find a sense of purpose and balance in your life. Nothing will happen unless you take action and create the life you want. This book gives you tools, strategies and mindsets for succeeding in life. See the majority of people go through life wondering of how they could have lived their lives better than they did, how did this happen, because the lack of purpose and direction. This is what this book is offering you. No one will change your life, only you can. 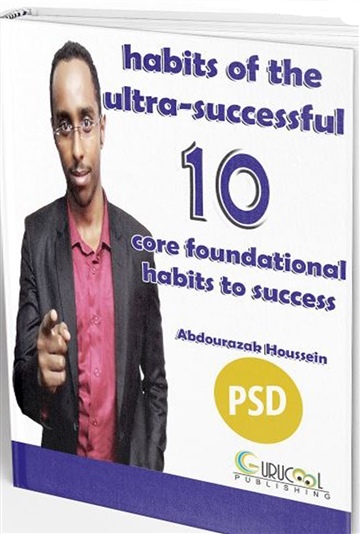 This book offers you the environment to build your new life, the successful life you want. In order for you to set yourself up for this journey, you need to cultivate the habits of the ultra-successful people, the habits that will make a big difference in your life. These habits are followed by the great. Successful people wouldn’t get where they are today without cultivating these ten habits. Literally those ten habits run their life, it’s their beating heart. So the shortcut to success is to model the successful and this what the book is offering you , a chance and insights to model and leverage your life for success instead of being a victim of your circumstances for the rest of your life. Give these ten habits full commitment, your life will turn into a miracle, people will not recognize you, you will become your new true self. You will leave the life of average and mediocrity, say goodbye to average results, to average people, to average performance and say welcome to phenomenal life, people did it , so you can too, take action now. Napoleon hill said: “ it is most appalling to know that 95% of the people of the world are drifting aimlessly through life, without the slightest conception of the work for which they are best fitted, and with no conception whatsoever of even the need of such a thing as a definite objective toward which to strive.” If you are among the 95%, not any more if you apply the principles and strategies of this book. Set yourself apart from the rest of the crowd, because it the bottom where it’s crowded. Welcome to the top. It’s not about how you start, but how you finish. Wishing you happy successful living.